Yatterman Night is a sequel to the popular 70s anime Yatterman. However, it is also far more than that. It is a story that explores just what makes a hero and why heroes are such powerful symbols—as well as how those symbols can be twisted into something horrible. Yatterman Night follows Leopard, a nine-year-old girl and descendant of Doronjo—the most common reoccurring villain of the original Yatterman series. She lives in a post-apocalyptic wasteland with her mother and two friends—who are likewise the descendants of Doronjo’s lackeys. When Leopard’s mother gets sick, she tries to get medicine from the nearby Yatter Kingdom. However, instead of helping her, the “heroic” Yatterman shoot at her; and, without treatment, her mother dies soon afterward. It is then that Leopard comes to a realization: If the Yatterman are the bad guys, then that means her ancestors were the heroes. That means it’s her legacy to punish the Yatterman for falling into bad ways—by flicking them in the forehead to let them know they have done wrong. Leopard’s innocence is the key to her character—as well as the heart and soul of the anime. At nine, she is simply a good kid. She believes in truth and justice and that good will always win over evil. As the series goes on, she gets frustrated and more than a little sad, but she never gives up on her ideals. While physically she is able to do very little, she is the driving force behind the reborn Doronbo gang. However, Yatterman Night is Galina’s story as much as Leopard’s. When the gang stumbles upon him, Galina is an indecisive coward—so indecisive, in fact, that he can’t make any major decisions without rolling a die and leaving his response up to chance. His entire life is little more than desperately clinging to Alouette—his blind and traumatized childhood friend. Yet over the course of the series, Galina learns much through his association with the Doronbo gang—passion and drive from Leopard; inner and outer strength from Tonzra; and how to build machines from Boyacky. He becomes a true hero as the show nears its climax. It is excellent, measured character development that makes the changes in him seem realistic and natural. Yatterman Night is a heroic inversion narrative—one built around swapping the usual hero and villain roles in a well-known story. In the original series, the Yatterman are heroes and Doronbo are thieves working for an evil alien. In Yatterman Night, the people are so oppressed by the Yatterman that Doronbo are the only possible heroes—and their goal is nothing less than to metaphorically steal freedom for the people. Of course, the people they encounter tend to react in terror whenever the gang approaches. Much of this is a consequence of the commonly known stories in which Doronbo always equate to evil. However, no small measure of their dread also comes from the population’s utter fear of their robotic Yatterman overlords. Labor camps or worse are the fates that one can expect for even the most minor act of rebellion towards the state. The most disturbing part of Yatterman Night is how it takes the cute and campy silliness of the original 70s anime and twists it into something terrible. The brightly colored mecha and showy costumes have become symbols of fear for the common man. Then there is the Yatterman cheer and accompanying silly pose. Watching the brutalized people repeat this in response to their abusers is just another humiliation they have to bear. In the world of Yatterman Night, the forces of the Yatter Kingdom expect its citizens to respond happily to the punishment of their friends and family. When her husband is sent to a labor camp, even a pregnant wife must cheer loudly and smile happily for his certain death from overworking. It’s more than a little unsettling to watch as time and time again what should be silly and uplifting is used as a weapon of terror and control—which is the point. The big (though easy to guess) reveal in Yatterman Night is that neither the Yatterman nor their descendants rule the Yatter Kingdom. Instead, it is Dokurobey, the big bad of the original series (Doronbo’s evil alien boss). After losing time and time again to the Yatterman, he bided his time, blew up the moon, and watched as the resulting meteor strikes decimated mankind. But that was not enough. For further revenge he decided to set up a haven for all that remained of mankind and used the forms of their greatest heroes to punish mankind—until every single one of them died. Even as Dokuroby tortures the remaining human population, he attempts to make them feel thankful for the punishment by reminding everyone that the Yatterman are heroes who saved mankind and gave them a place to live even after the meteoric apocalypse. In this way he both taints and strengthens the heroic symbol the Yatterman represent. In the end, though, this is his undoing. Galina and Alouette are able to claim the title of Yatterman for themselves. This puts them in the role of the hero in the eyes of the people—allowing the two to rally the population and convince them that Dokurobey is behind their suffering. Of course, this has a downside as well. The cultural archetype that Yatterman are good, Doronbo are evil is so ingrained in the minds of the people of the Yatter Kingdom that there is no way for Leopard and her companions to ever be viewed as the heroes they are. For a cultural parallel, think of the Nazis. If a group of people went around doing nothing but good deeds while dressed in full Nazi regalia, they would still be viewed with hatred. The idea that Nazis are evil is just too ingrained in our culture to be overcome. Thus, the series has a bittersweet ending. While Doronbo saves the day (along with the new Yatterman pair), they have no place in the society they saved. Instead they return to their radioactive wasteland, forever to be separated from Galina and Alouette, the new rulers of the Yatter Kingdom. However, that doesn’t mean Leopard regrets what she did. She did the right thing because it was the right thing to do—and that brings her peace. 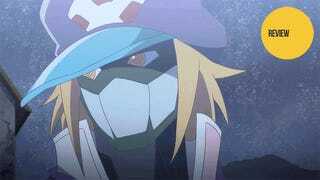 Yatterman Night aired on Tokyo MX in Japan. It can be viewed for free and with English subtitles in the US at Funimation and Hulu.